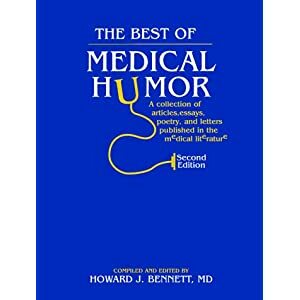 The Best of Medical Humor « Howard J. Bennett - Pediatrician and Author in Washington, D.C. Humor has been published in medical journals for over a hundred years. Those areas targeted for comic relief include medical school and residency, academia, language, writing and publishing, research, and clinical practice. The collection includes satires, spoofs, letters-to-the-editor and other silliness that pokes fun at doctors, medicine, and healthcare. The material has been selected from a wide range of journals, including JAMA, The Journal of Family Practice, and even The New England Journal of Medicine.